“670 million people worldwide live with visual impairment due to uncorrected refractive error." presbyopia: difficulty in focusing on close objects, for example books. It differs from the other disorders in that it is linked to ageing and occurs almost universally. Refractive errors cannot be prevented, but they can be diagnosed by an eye examination and treated with corrective glasses, contact lenses or refractive surgery. 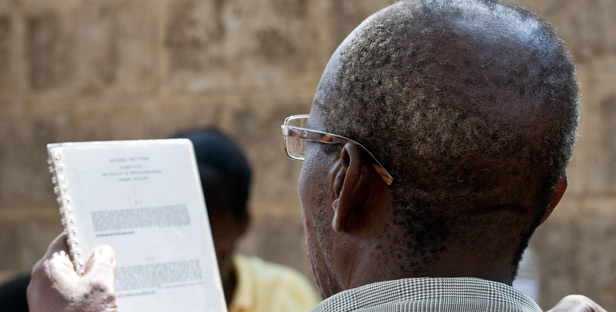 Every year, Vision Aid Overseas utilises the skills of hundreds of optical volunteers who are able to treat thousands of patients by giving them an eye test and correctly prescribed glasses. Vision Aid Overseas is committed to establishing locally based eye care services in every country in which we operate. One major contribution is the development of Vision Centres where patients can receive a walk-in eye examination, purchase an affordable pair of glasses and be referred for further specialist care if necessary.